One of Keurig’s bestselling budget, single-serve coffee makers, The Keurig K15 brews all K-Cup pod varieties from all K-Cup producers. You can make coffee, tea and hot cocoa at the push of a button with the same quality Keurig you can expect from their higher end coffee makers. If space is important, you want to brew your own coffee grounds (and not just K-cups) or you’re on a budget, choose the Keurig K15 personal brewer. The Keurig K15 brews coffee, tea, hot cocoa, specialty, and iced beverages. Basically if the beverage is made in a K-Cup, it is compatible with the K15. Unlike many of the more pricey Keurigs, the K15 accepts My K-cup, a reusable cup that allows you to add your favorite ground coffee. 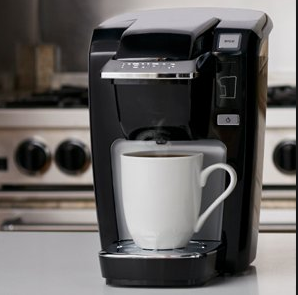 The Keurig K15 brews your beverage in under two minutes. This is the same brew time that many of the larger, more expensive Keurig Coffee Makers have. 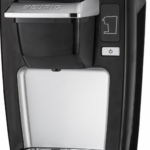 Some users prefer their coffee faster, which is possible with Keurigs that have a water reservoir, which the K15 does not. The K15 heats the water on demand, which means more time between you and your brew. The Keurig K15 brews beverages in the following sizes: 6, 8, and 10 oz. The Keurig K15’s compact size makes it perfect for a small kitchen set up or to take it on the go. It’s currently the most compact Keurig available. The Keurig K15 comes with a removable drip tray that allows for easy cleanup. The Indicator Lights on the Keurig K15 will help you through each step of your beverage brewing. To use the K15, begin by filling the small tank with water, pop the lid and insert your favorite K-cup or ground coffee, push the button and you’re good to go. After 90 seconds of inactivity, the Keurig K15 turns off. 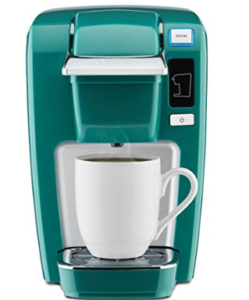 The Keurig K15 is available in Black, Chili Red, True Blue, Jade, Platinum, Greenery, and Plum. The My K-Cup Reusable Coffee Filter is the simple way to brew any ground coffee in your Keurig brewing system. If you want to brew a beverage that is not available in a K-Cup pod, the My K-Cup Reusable Coffee Filter is the way to go. It’s easy to feel confused when trying to tell the difference between the K10 and K15. Essentially they are the same and are similarly priced. However, the K15 is newer (and features newer technology) and is offered in several different colors. 1. Space Savings. Whether you want to use it in your kitchen, dorm room, office, or RV, the K15 is so portable, it can be taken virtually anywhere. It’s one of the smallest Keurigs. 2. Price. There is not a comparable coffee maker on the market that performs as well as the K15 in its price range. 3. Easy to clean. Unlike other models, the K15 doesn’t have a water reservoir to keep clean. 4. Compatibility. It is compatible with all K-Cups as well as the K-Cup Reusable Coffee Filter, which allows you to use your own ground coffee. 5. Brew Sizes. You can choose your brew size to make a little or a lot. The options are 6, 8, and 10 oz. 1. No water reservoir and a long brew time. This means that you will have to fill it up with water every time you want to make a beverage and wait for the water to heat up every time you want to brew a cup. There does seem to be a level of frustration from K15 users about that. 2. Single Serving. As with most products, one of the pros can also be a con. It is a great machine for single cups. However, if you have visitors and need to make multiple cups of coffee, there is no way to make the coffee or other beverages in bulk. 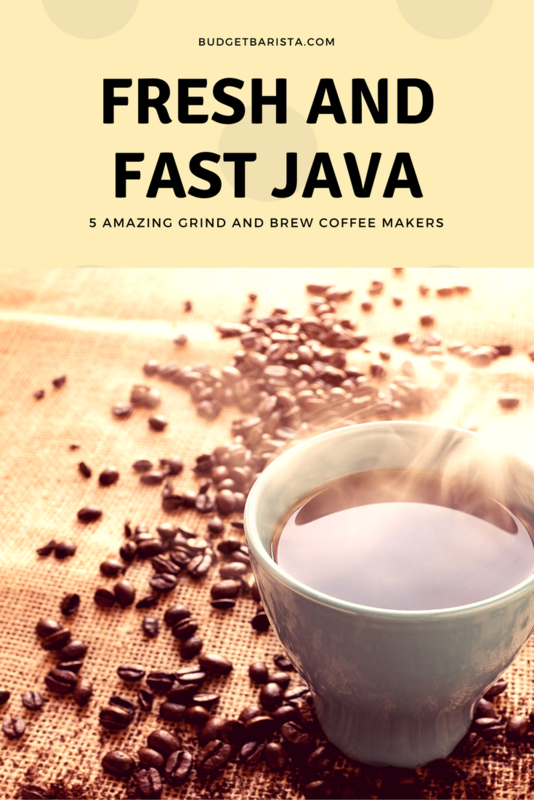 There are users who have stated that they keep a regular 12-cup coffee maker in their pantries for those situations because they love their Keurigs so much. 3. There is no way to select your brew strength on the K15. With some of the higher end Keurig machines, you can adjust the strength of the brew. But with the K15, the size of the beverage is really all you can control. Users seem to agree that the taste is right in the middle: not weak or strong. 4. One con that I hesitate to list is that the unit is loud. Compared to regular coffee makers, it is a little louder while brewing. If you compare them to another Keurig Coffee Makers, they are not any louder when brewing the beverage. 5. At one point, there was a “technical problem” and the K15 was recalled, but Keurig re-released it, and there have not been any of these technical problems reported since. So if you’re tempted to pick up a second hand model, you may want to opt for a new K15 to ensure it’s problem free. 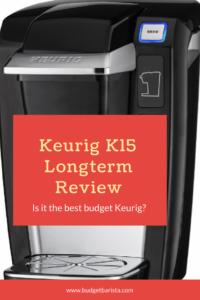 It’s easy to see why the Keurig K15 receives so many high marks from users. The recall seems to have fixed any of the issues users were having with the coffee makers. The Keurig K15 is a really good beverage maker, especially if you want a no-fuss cup of coffee. The Keurig K15 is also one of the cheapest models that offers the option of using your own ground coffee. 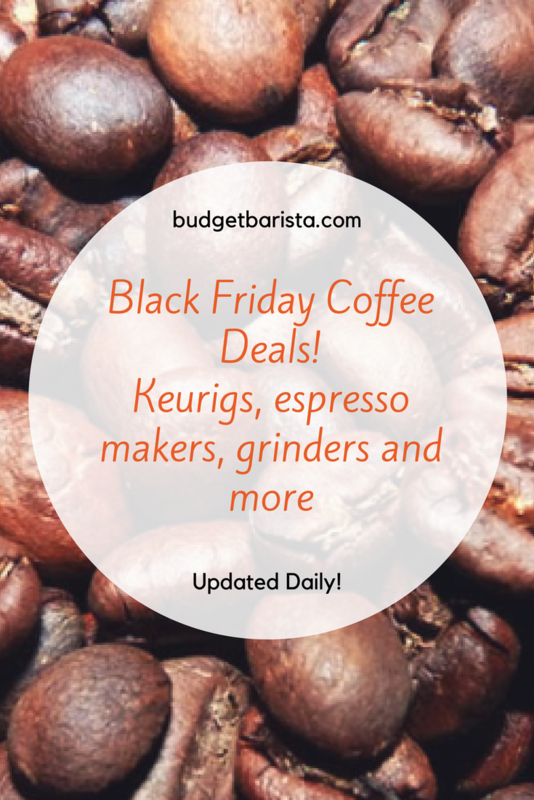 If you are looking for all the bells and whistles often associated with Keurigs, you may want to spend a little extra on one of the larger models like the K55 or K575. If you are looking for convenience and portability along with a good single-cup beverage maker, the Keurig K15 is for you.